Piri Pica’s menu, it turns out, also features a fried chicken sandwich. Taken together, all the hype suggested that this sandwich — a fusion item with a Southern bent — was shaping up to be Picudo 2.0: the best of all worlds. “How spicy do you want it?” asked the counter person when I ordered the sandwich. He smiled knowingly, perhaps a warning for what was to come. I was excited. The sandwich came: Toasted ciabatta bun. Nice. “Cabbage-herb slaw” — crunchy, not too saucy, infused with tangy pickles — very cool. Crunchy (buttermilk?) batter, slightly sweet — a godsend to a man lost in the fried chicken wilderness (the distance between Media Noche and Piri Pica, about 0.3 miles in actual distance, but what seemed a life-long existential voyage in fried chicken terms) — impressive. But then the rubber hit the road; the rubber being the chicken and road my mouth. One half of this restaurant’s raison d’etre — chicken — was really dry. Like, take too big a bite, and you might find yourself pre-masticating this stuff, bird-style, onto your plate. That would have been forgivable had the restaurant’s other claim to fame — “Piri” (the actual pepper) and “Pica” (“sting” in Portuguese) — was actually spicy. I had ordered the “Pica Pica Pica!” sauce, the extra spicy option, and it was more benign than diet ketchup. Mark: What’s going on here? In terms of marginalia, Piri Pica did everything right. Extra special attention was paid to the bun, the slaw, and the batter. But the chicken and its supposed “extra spiciness” were, frankly, disappointing. Can we, perhaps, deduce that the fried-chicken-sandwich craze in our neighborhood is an exercise in pretense? Offer a fried chicken sandwich — no matter how illusory — and people will come? It seems I’m still lost in the woods. How about you? Julian. After flaming out at Media Noche, you swore you were going out next for a “real” fried chicken sandwich. Who knew you would choose Piri Pica. You expect an “authentic” fried chicken sandwich from the Portuguese? OK, they had the colonial experience. But it was different. Alas. 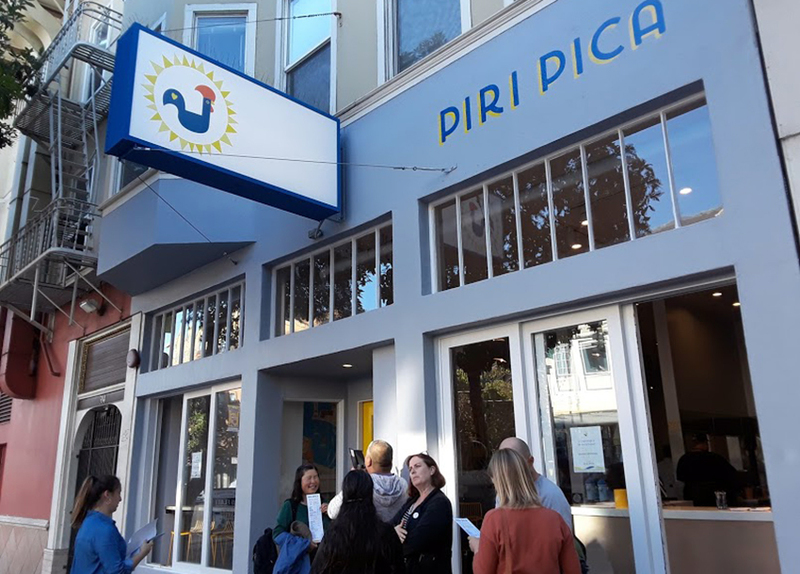 Piri Pica is, as advertised, a high-concept, low-overhead eatery fusing contemporary Portuguese cuisine with enduring American comfort food. True confessions. I’ve gone to Piri Pica twice: once for pleasure, once for work. The time I went for pleasure, I ordered the spicy. Not the extra spicy, Julian; I’m an old man. Turned out the spicy was so hot it overwhelmed the rest of my day. Which makes me wonder about the bland extra-spicy you got. Maybe they gave you the zesty lemon by mistake. That’s the option I chose when I went back for work. You may have thought it bland because it has zero zest and the lemon is more of a rumor. Unlike you, both times I was served a piece of chicken rather than a slice of boiled rubber. White meat. I wouldn’t say juicy, but I wouldn’t say dry. As for taste, I had little doubt it was chicken. Two plumpish pieces, deep fried in … I don’t think it’s buttermilk, and the cooks at the time were not sure (the chicken is pre-battered before being tossed, unceremoniously, into a deep fryer). The shell produced was crispy or crunchy — maybe a mix of the two — but nothing to write home about. Tasteless. Without the slaw, which was simply sloppy rather than a huge mess, the sandwich would have been dull and disappointing. I have to take issue with you about the pickles. Perhaps in these days of wildfires, mass shootings and mid-term election madness, pickles in a fried chicken sandwich may not seem like the sexiest or most controversial nit to pick. But here on the Fried Chicken Sandwich Desk, the Devil is in the details (and everywhere else). The “pickles” I got looked and tasted like little slices of Costco pickles. The kind you get at Open Studios. Maybe like “Chicken” John Rinaldi, Piri Pica will have to fail to succeed. You’re not lost Julian, you’re in the Mission. You can find the whole fried chicken journey here.